Reading the editorial in today's Guardian I was struck by two things. The shallowness of the analysis. And the bitterness of the comments that followed. The first of these is evident in the rather quaint notion that Ruth Davidson's speech the other day marked some sort of major shift in Tory thinking on devolution. The reality, of course, is that the Tories are no more offering firm proposals on "more powers" than their British Labour allies. Their interest in enhancing democracy in Scotland is a function of the perceived threat of a Yes vote in next year's referendum. With that threat removed, all the British parties will suddenly lose interest in devolution. And what of the threat of a Yes vote? Is it, as the analysis offered here suggests, such a remote possibility as to be hardly worth reflecting on? Only if one looks no farther than the headline figures in polls. While these would indicate support for independence at no more than 35% what they do not make clear is just how weak the assumed No vote is. Polling also shows that, when people are asked about what powers they would like the Scottish Parliament to have, a clear and in some cases substantial majority indicate that they want powers that they cannot have while Scotland remains bound to the anachronistic union.. Most people in Scotland want independence. They just haven't yet realised that the thing they want is called independence. What they do know is that the Better Together mob offer nothing. A No vote is a vote for the status quo, at best. And, as already noted, with the leverage of a possible Yes vote removed, it is almost certain to result in a rolling back of existing devolution; the "repatriation" of powers to the cesspit of Westminster; slashing of Scotland's budget; punitive welfare "reforms" beyond anything we've seen so far; rigging of the electoral system to ensure British parties will always hold power at Holyrood; and much else besides. The polling is deceptive. Most of those counted as No voters have actually already rejected the status quo. They are more like Yes voters in waiting. As increasing numbers of them realise the dire implications of a No vote, they will move - first to the undecided category, and then to committed supporters of independence. What Ruth Davidson's speech indicates is some sort of low-level awareness in the British parties that they are losing. That they chose the wrong strategy when they rejected devo-whatever. That the disinformation, distortions and downright lies are not being effective. That the ever more inane scare stories aren't working. They are now desperately trying to deceive voters into thinking that a No vote means enhanced devolution. They are setting up "commissions" to provide them with a pretext to <b>talk about</b> "more powers" because they have belatedly realised that they have nothing to say to the people of Scotland. Nothing to offer them. While the mainstream media continues to peddle a cosy consensus informed by the perspective of the British state, politics in Scotland has changed. The referendum debate in particular has moved on apparently unnoticed by the majority of commentators. The question people in Scotland are asking is less and less why they should vote for independence and increasingly why they would want to stay with a UK that has irretrievably succumbed to the ideology which is driving the Tories' economic and social vandalism. Independence has long since ceased to be the big scary abyss that the British parties still try to portray with a desperation that borders on the ludicrous. Independence is normal. It is the default condition of all nations. It is the constitutional status to which the people of all nations aspire. In Scotland, more and more people are wondering why they should continue to be the exception. Why that should provoke such a bilious response from so many people outside Scotland continues to be perplexing. Capitalist ideology is rife with pernicious myths. The myth of wealth creation; which holds that inequitable distribution of resources is explained by the magical creation of new resources rather than the transfer of resources from the many to the few. The myth of the "trickle-down effect"; which holds that the rich feed the poor rather than feeding off them. The myth of the "path to prosperity"; which holds that those at the back of the queue will one day have the things enjoyed by those at the front if only they are patient. Outside the bubble of capitalist mythology, resources ultimately and inevitably come down to matter/energy which can neither be created nor destroyed but only transformed or transferred. Wealth is not created but acquired. And it cannot be acquired other than at some cost to another part of the system. Outside the bubble of capitalist mythology, the only time little fish eat big fish, rather than vice versa, is when the big fish is dead. Or when the little fish take collective action. Outside the bubble of capitalist mythology, the path to prosperity for most leads only to a place that has been ravaged and depleted by those who got there first. A barren place where all that remains is a sign telling them that their turn will come so long as they don't push. And that they can only hope to make the line move faster by making sacrifices to "incentivise" those at the front. But perhaps the most pernicious and insidious myth of all is the one being peddled here by Alex Massie. 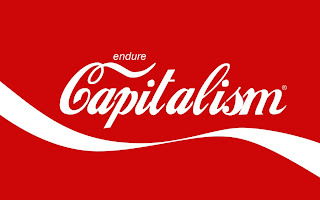 The myth of the inevitability of capitalism. A myth which holds that the inequity and injustice of the capitalist economic system is natural. Ordained. The unavoidable outcome of some immutable universal law rather than the consequence of choices made by those with the power to choose in the interest of preserving and expanding that power. It is the myth of the capitalist economic system as a remorseless and undeniable force of nature rather than a contrivance of self-serving, avaricious, fearful and fallible human beings. It is the dogma of despair. It is a message that mocks hope and aspiration. It is the worm in the ear of the masses that speaks to them of the futility of ambition and urges the relief of resignation and the ease of surrender. It is a denial of our capacity to choose differently. Worse! It is a denial of our right to dream and to be motivated by that dream rather than by fear. The first choice we have to make is that we will not be denied. That we will insist on our right to have a dream and to strive towards its realisation. And if that requires that we reject constitutional and political arrangements that are an impediment to our striving, then so be it. We will take our independence. And we will take our chances. Adapted from a comment on Alex Massie: Forging the fiscal future in The Scotsman. Observers of the ongoing debate leading up to Scotland's independence referendum will surely have observed that the arguments offered by Better Together, the Tory-led anti-independence campaign, tend to be riddled with perplexing inconsistencies and contradictions. For example, there is the fact that Alistair Darling and his Tory paymasters glibly insist that in the UK we have "the best of both worlds". Yet whenever the SNP suggest that something might be the same, or broadly similar, after independence the British parties insist, with equally bilious fervour, that this is totally unacceptable. More of this in a later article. Right now I want to focus on what I think may be the explanation for the inconsistency and contradiction that pervades Better Together's propaganda. It seems that they are completely unable to recognise inconsistency and contradiction. They don't know what these thing are. I came to this conclusion as I looked at a recent ill-thought publication from the Better Together campaign (left). The leaflet purports to show contradictions and inconsistencies in statements by Finance Secretary, John Swinney. It seeks to do this by comparing quotes from Swinney's speech to the recent SNP Conference in Inverness with selected extracts from a discussion paper he presented to the Scottish cabinet more than a year ago. 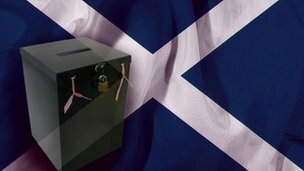 Let's look at a couple of the items held up as damning indictments of the SNP and "proof" of the British parties' contention that Scotland is uniquely disqualified from enjoying the normal constitutional status of a nation because economics is not a precise science. Conference Speech: We are better off than the rest of the UK. Cabinet Paper: Both Scotland and the UK are expected to run a net fiscal deficit...Scotland would have a marginally larger net fiscal deficit than the UK. There is only a contradiction here if one is foolish enough to imagine net fiscal deficit to be an absolute and definitive measure of how well off a nation is. The reality, of course, is that the economic health of a nation cannot be judged by looking at one metric in isolation. Many factors must be taken into account. And even looking solely at fiscal deficit we observe that, as in other aspect of life, it is not size that matters but sustainability. Conference Speech: Oil prices are higher than the Office for Budget Responsibility predicts. Cabinet Paper: The OBR forecasts...have not been seriously challenged by the industry or by independent commentators. Again, we are left wondering where the supposed contradiction is. The statement that oil prices are higher than the OBR's notoriously unreliable estimates is no more than a statement of fact. If they were not challenged by "independent commentators" then this would suggest that it is they who have been found wanting in their analytical abilities. Or, perhaps, their independence. And it is simply untrue to say that OBR pronouncements have not been challenged by the industry. In March 2013 Oil & Gas UK chief executive Malcolm Webb wrote to Robert Chote, the chairman of the OBR, pointing out the discrepancies between the OBR figures and Oil & Gas UK’s own 2013 Activity Survey, which draws on data supplied direct from operators. In short, John Swinney's conference speech does not in any way contradict what he said over a year ago in an entirely different context. It merely acknowledges the situation as it is now. Something which Better Together appears unable to do. One more. And we stay with the oil revenues which Alistair Darling and his Tory allies are determined to convince us are an onerous burden that will be the ruination of Scotland. Conference Speech: We are on the cusp of another great boom in the oil industry. Cabinet Paper: There is a high degree of uncertainty around future North Sea revenues, reflecting considerable volatility in production and oil prices. The claim that there is some contradiction or inconsistency here actually tells us more about the thinking in Better Together than it tells us about John Swinney. Because there is only a contradiction if one assumes that terms like "uncertainty" and "volatility" are synonymous with negative outcomes. The fact that volatility implies the possibility of increase just as much as decrease simply doesn't seem to enter into the thinking of those who toil in Better Together's mills of doom. According to them, only bad things happen in Scotland. And the fates must inevitably be even more cruel to that benighted land should she presume to challenge the righteous might of the British state. So unfurrow those brows, folks! You may abandon the frustrating and futile search for those elusive inconsistencies and contradictions. Blair McDougal and his little gang of grim-grinders either don't know how to recognise such things, or they are so desperate to find them that they see them where they don't exist.